TCExam is a Web-based Open Source Computer-Based Assessment (CBA) software application hosted on the GitHub repository. TCExam is divided in two main sections: Public and Administration. The public area contains the forms and the interfaces that will be used by users to execute the tests. In order to access this area, the users must login, inserting their username and password in the specific form. Once logged in, the users will see a page with the list of the tests to complete, and possibly the tests already done. The list of tests visualized depends on the relative time frames, the user IP address, the user's group and the condition if they have already been performed or not. The list of tests visualized depends on the relative time frames, the user IP address, the user's group and the condition if they have already been performed or not. The list of active tests shows, other than the test name, a list of links which can be different case by case: info - to display test information; execute - to start the test; continue - to continue previously interrupted test; results - to display test results (TCExam automatically grades the users' answers in real-time, considering the question difficulty and the test base score). The test execution form contains two sections. In the first section the user may answer the selected question. The second section contains a menu to select the questions and display their status (selected, displayed, answered, difficulty). 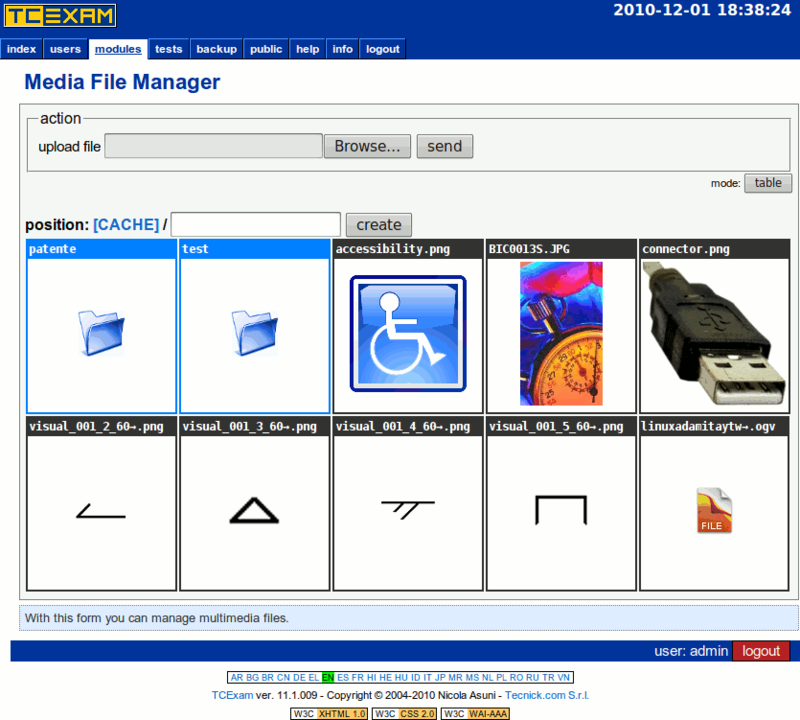 The user is freely allowed to change the answers at any time during the test. Users may leave a general comment to the test and also terminate the test at any time. It is not necessary to confirm the end of the test since it is considered to be concluded when the expiration time has been reached. The administration area contains the forms and the interfaces to manage the whole system, including the user and database management, the generation of the tests and the results. The access to the various administration sections depends upon the user's level and group. The test-takers activity could be monitored in real time by administrators. An administrator has the privileges to stop, restart or increase the remaining time of each test. Once a test is completed, an administrator can: manually grade the TEXT answers; display, export (CSV, PDF) and print the general and detailed results; send the results to each user by email; display the test statistics. TCExam may also generate tests in PDF format to be printed and used in a traditional Pen and Paper Testing (PPT).